A worthy successor to the illustrious 20 and other noughties that followed it, this is potent but vertical and elegant. Not as broad in the beam or packed with flavour as some manzanillas pasadas, but sharp, long, and a beautiful profile. Also a really interesting contrast to the Bota 59 and the Bota 60 that I have had recently. Where those were gentle and mellow this has a zip and sharpness to it. And finally a word for the bar of Angelita – stuff like this and Fino La Barajuela 2014 by the half glass, among many others. Absolutely cracking. One of my happy places here in Madrid – the bar of Media Ración – where in swish surroundings and with very pleasant dishes (honorable mention in Metropoli’s yearly awards) you can partake of little gems like this. 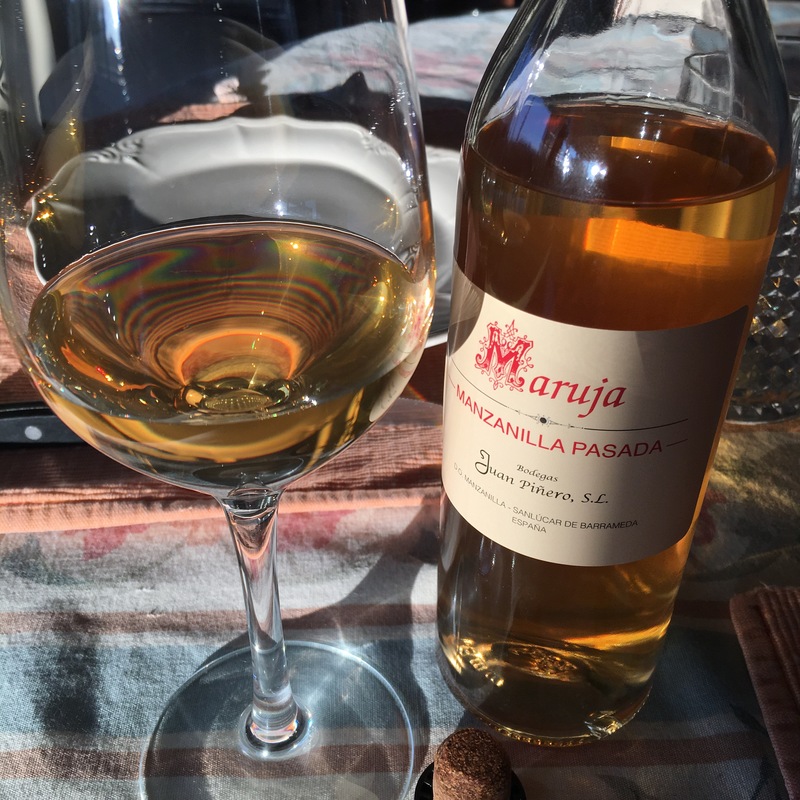 One of the “noughty” manzanilla pasadas by Equipo Navazos, this is one of the chalkiest wines you will find anywhere, and with its nearly three years in the bottle the mineral zing and mellow flavours seem to have dimmed a little leaving that chalk above the waterline. May not sound tasty but it really is – lovely wine. This was a second very special wine brought to lunch by Juancho Asenjo – the man is a legend – in Territorio Era recently. It had some tough competition on the day – a quite outstanding 20 year old Fino Carta Blanca – and has a tough act to follow in the form of its own descendants. You see it is a manzanilla pasada La Guita from (I think – memory is a bit hazy for some reason) the 1970s and would be a lineal ancestor of the outstanding “noughty”‘manzanilla pasadas released in more recent times by Equipo Navazo, which are among the very finest wines I have tried from the region. And this was a fascinating wine. Was a rich old amber in colour and was pretty clear, maybe just a hint of cloudiness. On the nose it was still there – a bit of old apple and straw – although not as punchy as it might once have been, and on the palate it was extraordinary. Not so much the flavours, which were still there and were enjoyable if a little muted, but a quite amazing chalky, almost chalk dust texture. The most mineral wine I have ever tasted without question – extraordinary stuff. Just lately I seem to find Equipo Navazos wines everywhere I go but to be honest that is no bad thing – certainly not when they are as enjoyable as this one. 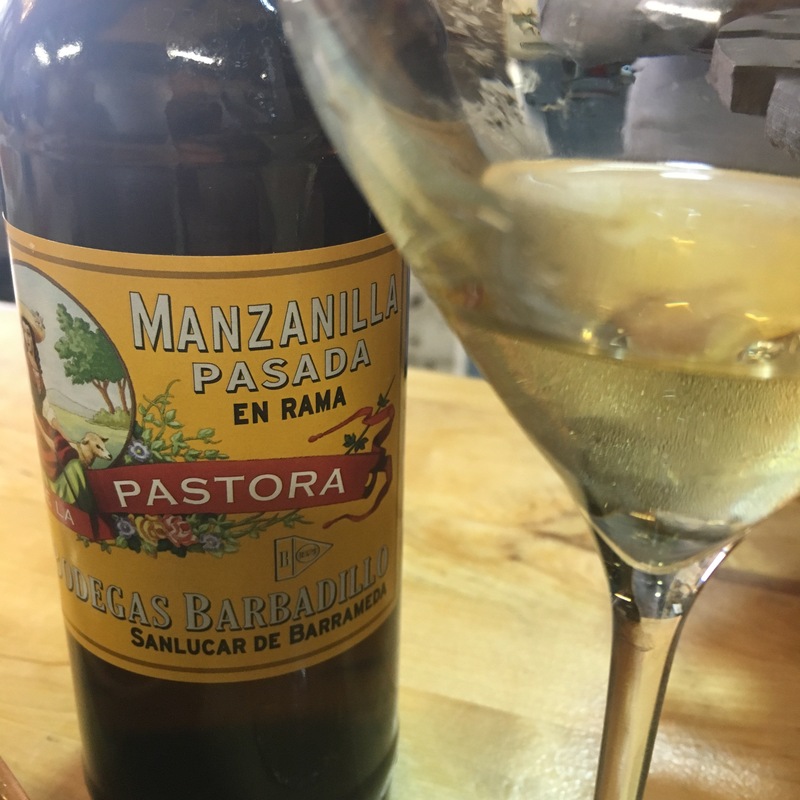 This Number 59 is sourced from a special solera set aside at La Guita and has all the characteristics of a top manzanilla pasada: mellow, fresh, fruitful, saline, and elegant. They are characteristics that make it a wonderful, versatile wine for the table and indeed a friend and I enjoyed a few glasses in Media Ración over lunch the other day. But it is also the kind of wine that is enough of itself – enjoyable but with plenty of complexity. This was bottled in June 2015 and looking back at my previous notes from October 2015 and February 2016 I would say it has held up very well – maybe a slight edge has been taken off it over time but it is still sharp and fresh. Love this wine, salty seaside nose with nice hints of apple just gone into baked apple, more baked apple and vegetable spiciness softened and broadened on the palate, and all in a sleek, saline and acid profile. A really nice wine and maybe would be a good place to start for a beginner learning to appreciate biological ageing. I had a glass yesterday in Territorio Era – another good place for anyone seeking to learn about these wines. One of my favourite examples of one of my favourite styles of wine. From Juan Piñero in Sanlucar this is one of the older, more intense manzanilla pasadas around. In fact at a recent dinner I had the chance to try it against some other top examples and it blew them away (a great example of the advantage of opening several bottles at once, as if any excuse were needed). It is a rich colour and has intense yeast, spice and herb aromas. Then on the palate searing, zingy salinity and savoury, spicey flavour, with just a hint of ftuitlike sweetness, like potatoes in a rich spicey tomato sauce. Hint of curry to it in fact. Then a finish that still sizzles. Just what I needed after a tough day. A beautiful wine.